Over the last few years there have been a number of research programmes with a focus on identifying and interpreting preserved melanosome structures in fossil specimens that may provide clues as to the colour of long extinct creatures. We have had papers published on ginger coloured dinosaurs (Sinosauropteryx) and interpretations of Archaeopteryx (A. lithographica) with black feathers. Establishing the colour of long extinct creatures, especially feathered dinosaurs has attracted a great deal of media attention lately. However, new research from scientists based at the University of Akron and the University of Texas in collaboration with a number of Chinese scientific institutions including the China University of Geosciences, has questioned the presumptions made in previous studies. In addition, this research team’s findings may provide new evidence as to a link between colouration of an animal and its metabolism. Finding and analysing the shape of preserved melanosomes within fossil material has been at the centre of dinosaur colour analysis. Melanosomes are specialised components within animal cells responsible for storage and transport of melanin, a natural pigment. Fossils of animals with feathers, have in exceptional circumstances, been found to preserve remnants of melanosome structures and it is from their shape and arrangement that scientists have been able to infer the colouration of long extinct creatures. However, the preponderance of preserved structures that indicate dark pigmentation has puzzled a number of palaeontologists. The preservation process may favour these darker pigments and therefore the fossil record may show a bias towards dark colouration. The interpretation of the colour of feathered dinosaurs has been challenged in a number of recently published articles. This new Sino/American research takes melanosame studies in a new direction. Not only does it challenge recently established conventions on fossil pigmentation analysis, this latest study may also provide a tool for understanding the evolution of powered flight and changes in dinosaur physiology that permitted the ability to fly to occur in members of the Dinosauria. 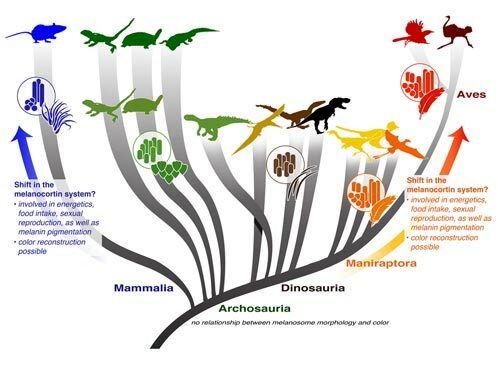 Publishing their work in the academic journal “Nature”, the scientists conducted an in-depth survey of the hair, skin and feathers of a number of extant vertebrates and compared these structures to those known from a number of Chinese vertebrate fossils. They found evidence for evolutionary shifts in the relationship between the shape of the melanosome and its likely colour. In addition, the researchers discovered that warm-blooded vertebrates (endothermic animals such as birds and mammals) shared a pattern of diverse melanosome shapes that was different from those seen in extant cold-blooded creatures (ectothermic animals such as crocodiles, lizards and snakes). The scientists discovered that when it came to melanosomes and dinosaurs, Maniraptoran dinosaurs and Paravians (those members of the Dinosauria believed to be very closely related to birds), also had a wide range of melanosome shapes and sizes. These patterns mirrored what the researchers found in extant warm-blooded mammals and birds. By examining how these different shaped and sized melanosomes evolved raises the intriguing possibility of melanosome shape, size and pattern yielding an insight into the physiology of dinosaurs. Melanosomes in the fossil record potentially linked to understanding physiology of extinct animals. According to this particular piece of research, melanosome shape and size may help with the colour decoding for some species, but in the case of others, the melanosomes may actually be very misleading. Over the course of their studies, the scientists compared melanosome structures of 181 living specimens with 13 extinct specimens and utilised a lot of the already published data on fossil melanosome diversity. The team concluded that cold-blooded reptiles living today show much less diversity in the shape of melanosomes than extant, warm-blooded birds and mammals. This suggests a link between the evolution of a greater variety of melanosome structures, increasing colour complexity in fauna and higher metabolic rates. The limited diversity in the shape of melanosomes in living, cold-blooded animals (ectotherms) shows very little correlation to body colour. The same principle seems to hold true for fossil members of the Archosauria (the group of reptiles that includes the Pterosauria and the dinosaurs). In short, when the spherical shape of fossilised melanosomes are considered in the preserved proto-feathers or pycnofibres of feathered dinosaurs, it may not be possible to determine the colour of these animals when they were alive, as modern reptiles only seem to have spherically shaped melanosomes but they come in many different colours and hues. Contrast this to those feathered dinosaurs believed to be closely related to birds (Aves). The research team found a huge range of different sized and shaped melanosomes, that may correlate to an explosion of colour within these groups. The shift in melanosome diversity seems to have taken place abruptly, near to the origin of pinnate feathers in Maniraptoran dinosaurs. The researchers were taken by surprise by the significance of the correlation in the pattern of melanosome diversity amongst Maniraptoran dinosaurs, Paravavians and extant Mammals and Aves. It is now known that many of the genes involved in pigmentation have roles in other processes related to digestion, stress management and reproductive behaviours. As a result, the evolution of diverse melanosome shapes may be linked to wider changes in the physical abilities of dinosaurs and their physiology. By studying melanosomes preserved in the fossil record, scientists might be able to infer aspects of dinosaur behaviour related to the evolution of a warm-blooded metabolism. The explosion of diversity in melanosome shape and structure seems to have taken place right at the origin of pinnate feathers, it may mark a “sea-change” in Dinosaurian physiology that occurred immediately prior to the origin of flight. 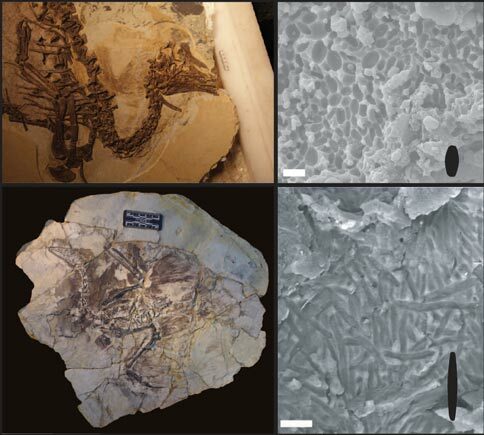 Feathered dinosaur and bird fossils used in the melanosome study. The picture above shows two of the fossils analysed in the study. The top picture shows a fossil of the feathered Therizinosaur known as Beipiaosaurus. This dinosaur shows the rounder melanosomes seen in extant crocodilians and lizards (enlarged area top right). The bottom picture shows the preserved remains of a bird that lived in the Mesozoic. Under the scanning electron microscope, a different melanosome shape is detected. These “skinny” melanosomes are unique to living birds and mammals and many of the feathered dinosaurs such as Maniraptorans. Changes in the diversity of these melanin containing organelles may indicate a physiological shift in feathered members of the Dinosauria that are phylogenetically related to those members of the Dinosauria closest to the origins of powered flight. It is also possible, note the scientists, that colour variation between species and different individuals within species resulting from an increased diversity of melanosome shape and structure may have been due to increasing evolutionary pressure on populations as more and more complex visual signalling behaviours came about. It is still very early days and palaeontologists have a long way to go when it comes to determining the exact relationship between melanosomes and endothermy. Ironically, what may turn out to be rather crude attempts at determining the colour of dinosaurs could well have opened the door to a better understanding of dinosaur physiology. Speaking of dino-bird evolution, an Oxford biochemist named Alison Woollard has said that dinosaurs can be recreated by reverse-evolving the bird genome. What do you think? We are aware of a Professor Alison Woollard a biochemist who, along with colleagues has explored the genome of nematodes and carried out extensive research into how groups of genes may instruct cells, but we are not aware of any specific, direct research on Paraves and the inheritance of characteristics with relation to the evolution of Aves, however, it is possible that we have missed the research papers, or that Professor Woollard may have been asked to comment on research on going at other Universities such as that being currently undertaken at Montana State. We suspect that the article may have only superficially covered what is an extremely complex subject. Some research has been published that shows in chicken embryos certain sequences of genes can be turned on/turned off to induce physical changes in the embryo, for example an extension of the five fused caudal vertebrae in the pygostyle (five tail bones fused together). Nascent teeth have been developed, in essence the gene for producing teeth, long dormant in the Galliformes (the Order to which domestic fowl belong to). Much of the focus of the research has been centred around gaining a better understanding of how genes or sequences of genes work, with longer term aims of applying the research to human medicine. The research effort is not directed at engineering a dinosaur, genetics has moved on so fast over the last two decades or so that our understanding regarding genes has been transformed but we are a very, very long way off manipulating the genome of a single organism to such an extent as to effectively revive a long extinct ancestor. Thanks for your input, much appreciated. Didn’t evolutionary biologist Shawn Carol say that there isn’t any gene for dentin or enamel in a chicken genome? We are not aware of any specific comments with regards to a Shawn Carol, but one of the palaeontologists currently investigating the evolutionary development of chicken embryos and exploring their links to Paravians is palaeontologist Jack (John) Horner, he has been heavily influenced by the work of Professor Sean Carroll, author of the best-selling book “Endless Forms most Beautiful” that came out a few years ago now. We are not familiar with any citation or quote from Professor Carroll with regards to the lack of any gene for dentine or enamel, more likely since Carroll is a molecular biologist, he may have commented on the research, but the current consensus is that the gene or gene sequence for tooth development in Aves is effectively dormant. This is what the Telegraph quoted Woollard as saying; that these genes are not gone but dormant, and that if we could find bits of ancient DNA from the non-avian dinosaurs, a non-avian dinosaur’s genome could be pieced together from these bits and it could tell us how to “de-evolve” a bird into a non-avian dinosaur by turning on dormant genes. But is it actually possible to find fragments of ancient DNA from non-avian dinosaurs and piece together the genome of one from that information? Have they found any bits of ancient non-avian dinosaur DNA yet?